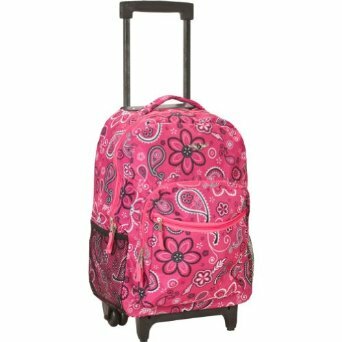 Sturdy, durable, well made, and convenient for school, work, and travel. Available in many bright and striking colors. A special compartment to place the laptop independently. High-strength aluminum alloy rod that can be adjusted to different heights. The straps can be placed in the back concealed pockets for the convenience and durability when the wheels are rolling. The linings of the inside pocket and the zippers are not that durable. This is the summary of consumer reviews for Tilami New Antifouling Design 18 Inch Oversized load multi-compartment Wheeled Rolling Backpack Luggage for Kids. The BoolPool rating for this product is Very Good, with 4.10 stars, and the price range is $60.99-$69.99. 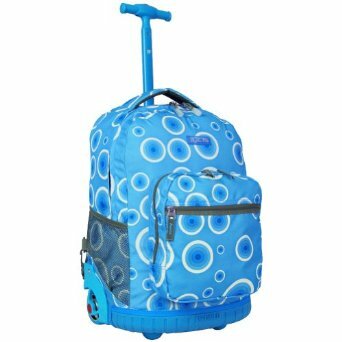 Tilami Rolling Backpack is a well-made, sturdy, durable, and convenient school bag for the kids. 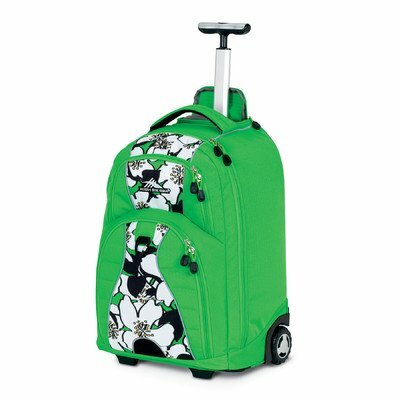 It has large storage capacity with a multi-compartment design that can hold more belongings. It comes with high-strength aluminum alloy rod that can be adjusted to different heights. 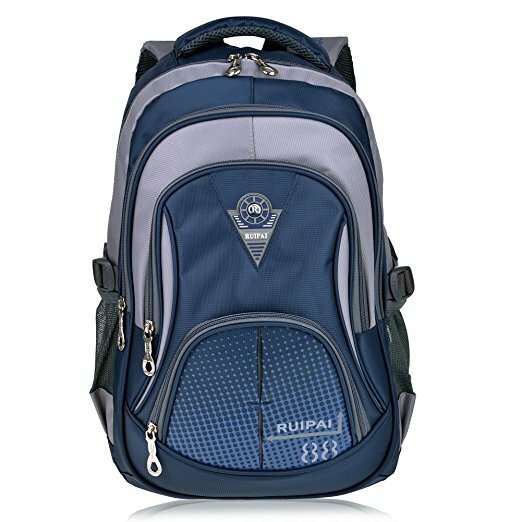 Tilami Rolling Backpack features the MAIN POCKET with enough space for a lot of things and a special compartment to place the laptop independently. There are two MEDIUM FRONT POCKETS - the first one is specially designed to place mobile phones, credit cards, wallet, and many other things while the second one is designed to place pens, small notebooks, and mobile. The SIDE POCKETS is convenient to place cups and umbrellas. The BOTTLE HOOK BUCKLE prevents bottle falling out of the side pockets. The straps can be placed in the BACK CONCEALED POCKETS for the convenience and durability when the wheels are rolling. 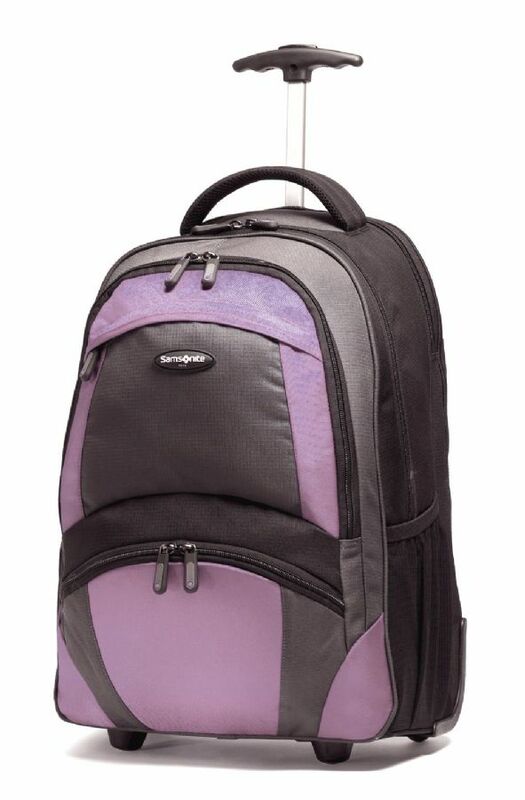 Users love and have recommended the Tilami Rolling Backpack as it is sturdy and durable for school, work, or travel. 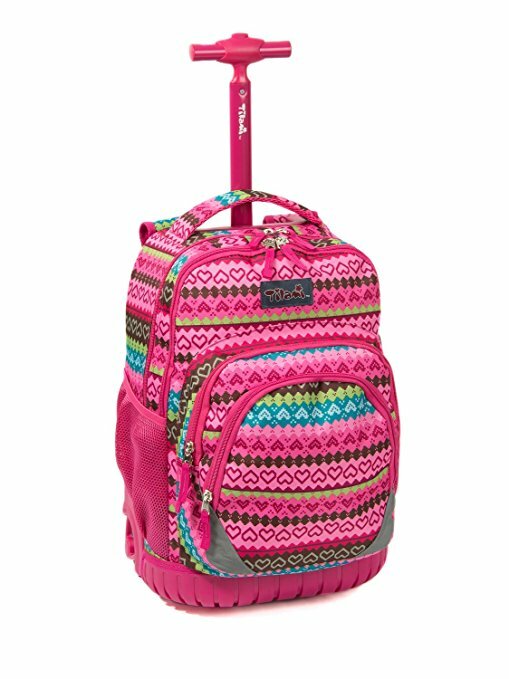 This backpack has plenty of room and several pockets enough to hold all the school books and supplies. The wheels are convenient when the bag is heavy. Kids love the bright and striking colors. 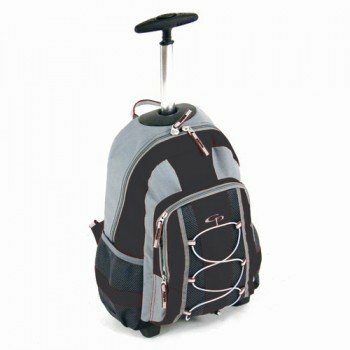 However, a few feel that the linings of the inside pocket and the zippers of the Tilami Rolling Backpack are not that durable. 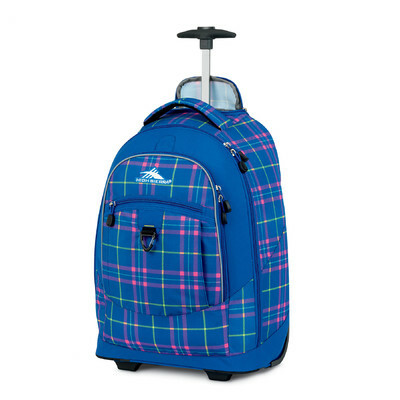 Overall, Tilami Rolling Backpack is convenient for school, work, and travel. It is available in many bright and striking colors and patterns. Zipper broke and clothe on inside ripped within the first few days of using it. Product as described, packaging as always 5 stars for Amazon.pockets are deep and zippers look strong. First the zipper got loose and fell, then the top part of the pull stick came off. The only reason it gets 4 stars instead of 5 is that one of the zippers doesn't work well and is constantly getting stuck. Had backpack for short period and one of the inside pocket linings near the zipper tore. This back pack was a waste of money. It was easy for my 5 year old to wheel it around the airport and it fit under the seat in front of us in the airplane (wasn't packed to its fullest capacity). There is plenty of room and several pockets that are well made. Awesome backpack, well made and very sturdy. Usually, the handle is the first thing to break, but this one seems to hold up well. Love the bottom "bumper" support. Looks great. It's plenty of room and looks like it'll hold up well. Several pockets that are well made. Awesome Backpack, well made and very sturdy!. Usually the handle are the first thing to break, seems to holding up well. If you've smaller one it'll fit well. Very well made, I like the bottom "bumper" support. I'm please with how it looks and feels (empty) and know it'll serve me well. It's sturdy looks great, easy to use. Strong and durable for school, work, or a small road trip. 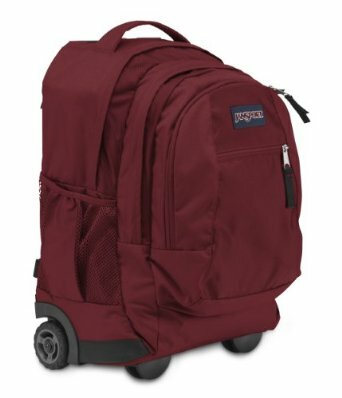 This rolling backpack has been great for nursing school. Vibrant colors and large enough to hold all school books and supplies. Kids carry a ton of heavy books for school, and it takes the beating. Great for school or work. Large enough to hold all school books and supplies. Pros: Vibrant colors, good room for my son's school books, pretty good build on the wheels and base. Perfect for school and a small road trip. This's been really great for nursing school though..
My daughter uses it to carry a ton of heavy books for school and it takes the beating. strong and durable school bag or for holiday usage, many compartment which is good. Will update at the end of some trips (also bought as a carry on for traveling) and a few more months of school but the quality seems pretty sturdy!. I ended up purchasing a Jansport Driver 8... a bit more money, but they've a lifetime warranty and it hold my son's school stuff with room to spare... jacket, water bottle, binder, lunch box all in the main compartment with room to spare!. The backpack is sturdy, and the wheels are convenient. Recommend this backpack. The bag is cute, roomy and works really well. Unlike my kids earlier bags, this empty bag feels like filled. Even if the bag is filled completely, there are wheels on the bag which are really helpful. The Tilami Bag is amazing. The bag is well built. The bag isn't of good quality. To start with, this bag is really big and made of tough material! Kids love the rolling backpack. my daughter absolutely loves this bag. My daughter loves her new rolling backpack. My daughter loves her rolling backpack. Great quality my daughter loves it!. Love This Roll Bag A Lot. High quality and my daughter loved it! My grandaughter loves this bag.